Author: Gustav Menzel. With a preface by: Wilhelm J.G. Möhlig. Series edited by: Michael Bollig, Wilhelm J.G. Möhlig. This book presents the biography of one of the most famous Namibian kapiteins of the early colonial period, Hendrik Witbooi. It differs from other biographies and biographical sketches of Hendrik Witbooi in that it views his life from the perspective of missionary history. 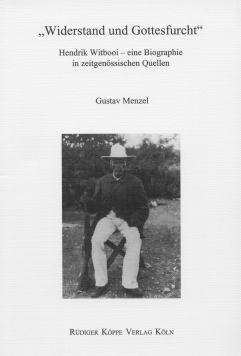 The author here draws on source material which is stored in the archives of the former Rhenish Missionary Society (now United Evangelical Mission, Wuppertal/Germany), such as letters written by the missionaries to their mother-house in Wuppertal, Germany, letters by Hendrik Witbooi, writings by the German colonial government, contemporary accounts of missionaries, and a secret chronicle written by the missionary Johannes Olpp. 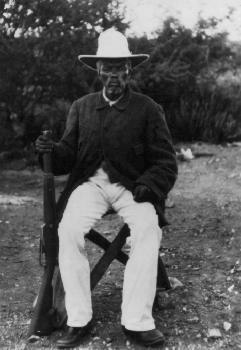 Witbooi received many impulses by the missionaries of the Rhenish Missionary Society and especially by his teacher and mentor Johannes Olpp which moulded his character and help to explain his later resistance against German colonial occupation. Whereas Hendrik was first lauded for his exemplary Christian faith by the missionaries, their attitude towards him changed radically when – following his religious awakening in 1880 – he continued the search of the Witboois for their “promised land” and engaged in conflicts with the Herero. During the following 16 years Hendrik’s authority and dynamism, fed by his belief in a divine mission, let him become the dominant kapitein over all the Nama – but also led him to cover the whole region of southern and central Namibia with raids and campaigns. In view of the chaos and violence he spread, the missionaries withdrew their favour, since they viewed his “mission” as religious fanatism. Meanwhile, Hendrik provoked the German colonial powers which were just establishing themselves by refusing to sign a treaty which would have forced him to give up independence and to resign to German rule, until he was finally committed to this by force of arms. The sources used in this book illustrate these events by allowing various perspectives. Thus, they contribute to the understanding of Hendrik Witbooi’s character as well as to the early colonial history of Namibia.